Learning English is very important for students. Why is English important? The answer is obvious. English has become an international language. Because of that in Indonesia English is taught beginning in the elementary school in order that the students are familiar with English and can use and communicate in English well. There are many ways to know the students’ proficiency in English. One of them is by using dictation. 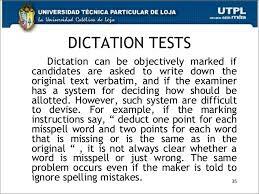 Using dictation as a testing device of listening is effective since dictation can check the students’ proficiency of English spelling through their listening skill. We realize that English as a foreign language is a difficult subject for Indonesian students to learn, because the language has a lot of rules which are different from Bahasa Indonesia (Indonesian). For example, pronunciation of most English words are not spelled the way they are pronounced, while in Indonesian language the students will never find any difficulty in pronouncing or writing down Indonesian words because it correspondences between sounds (phonic) and letters (graphic symbols). The grammatical rules, such as adding an –s ending to pluralize a noun of English words never occur in Indonesian grammar. Such differences will make the Indonesian students unable to comprehend easily the language being learned. They have to be trained both in written and oral exercise. Belum ada tanggapan untuk "DICTATION AS A TESTING DEVICE OF LISTENING: ANALYSIS OF STUDENTS’ ERROR"